At the tip of Manhattan is Battery Park so named for the artillery batteries that were placed here from Colonial times to the 19th Century. Indeed, the last remnant of those defenses, Castle Clinton, is one of the park's attractions. The park also has magnificent views of the harbor. 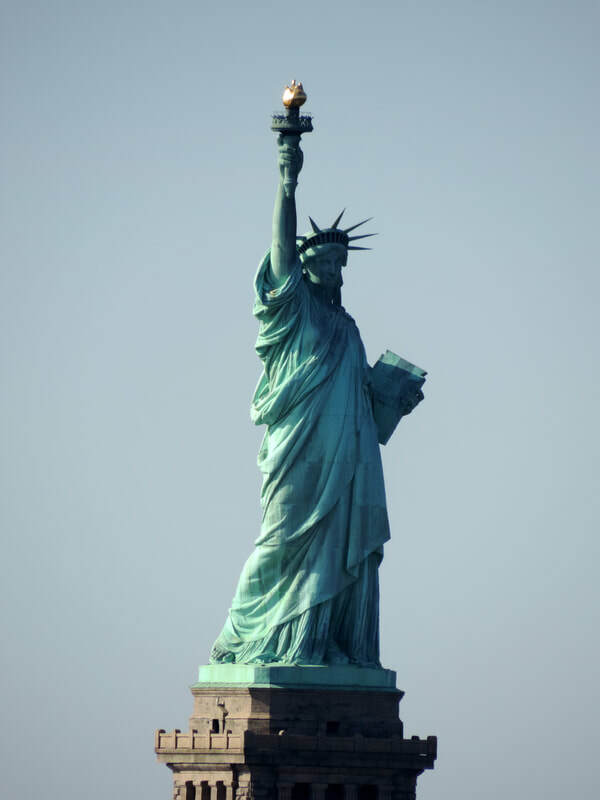 American people paid for the Statue's pedestal through contributions. It was dedicated on October 28, 1886. (Because of the Statue's popularity, the National Park Service encourages visitors to reserve tickets in advance). Part of the Statue of Liberty National Monument is nearby Ellis Island (below). Ellis Island was a gateway immigration inspection station from 1892 to 1954. More than 20 million people passed through this facility. 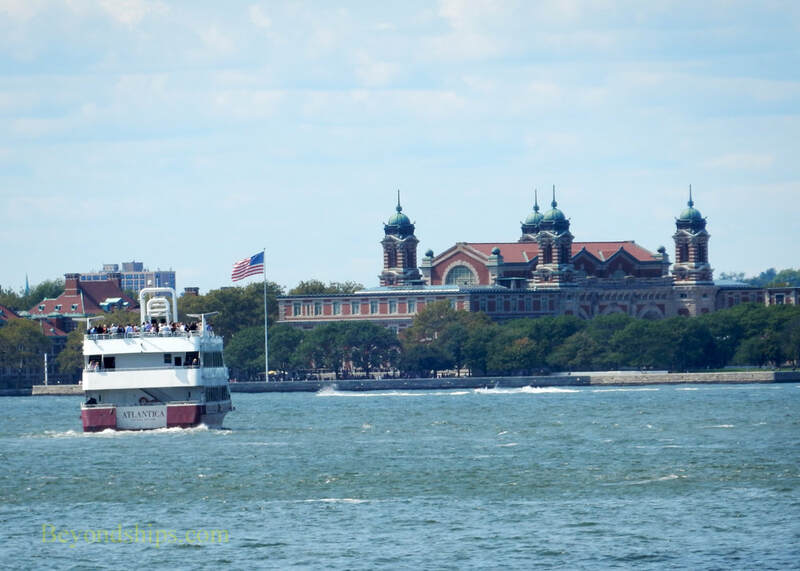 The ferries to Ellis Island also leave from Battery Park. 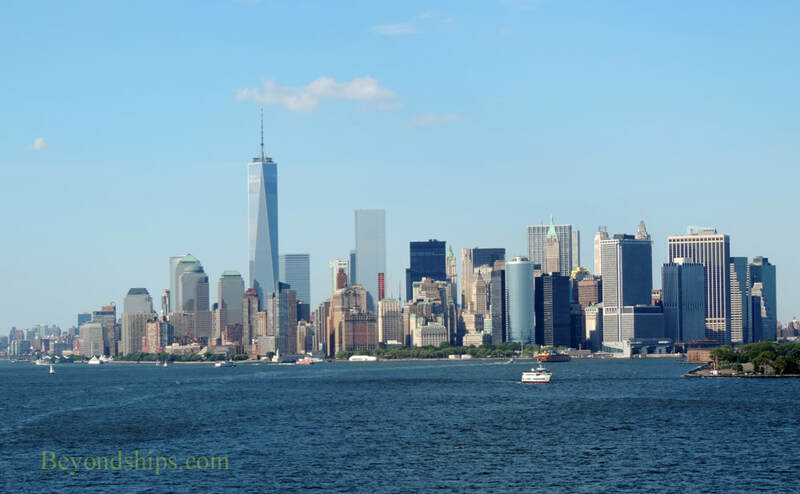 On this page, we look at some of the attractions of Downtown starting at the tip of Manhattan and proceeding up Broadway to City Hall. Hamilton U.S. Customs House at Bowling Green. 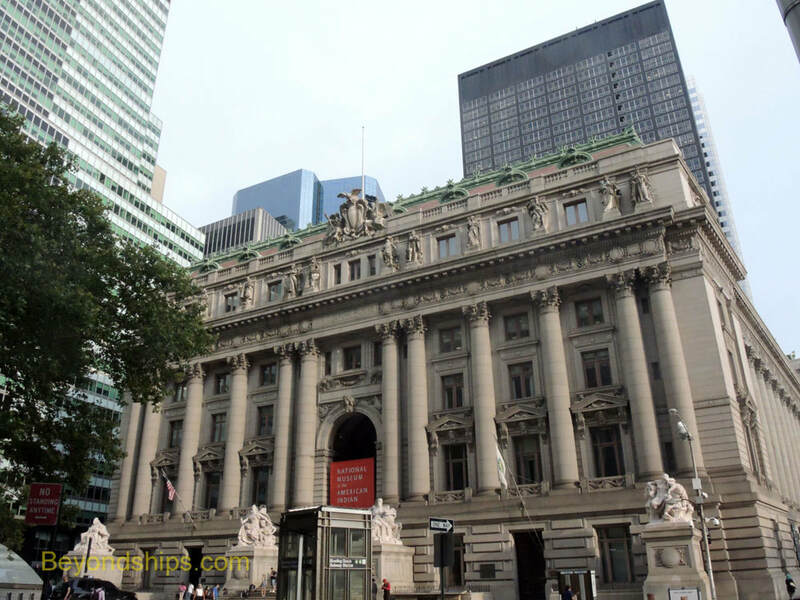 Designed by Cass Gilbert and built between 1901 and 1907, this is an impressive building. However, its real treasure is a series of frescoes in the rotunda by Reginald Marsh. 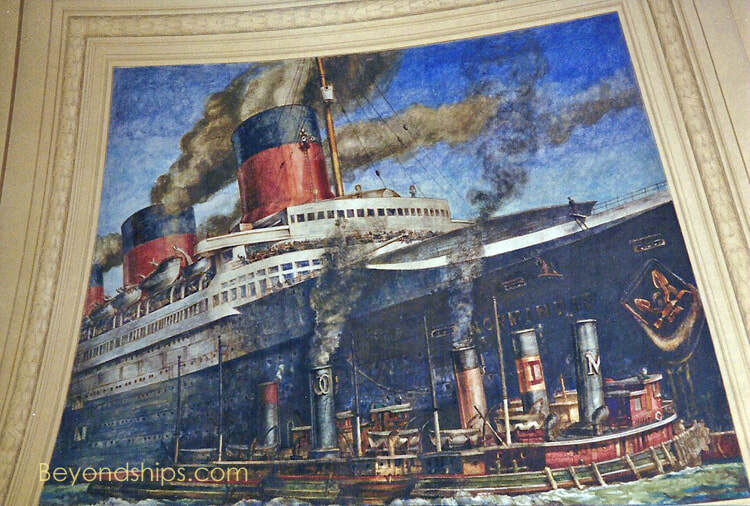 Done in 1937, these panels depict some of the great ocean liners of that period including the Normandie and the Queen Mary. Going up Broadway, you pass through the Canyon of Heroes. This section of Broadway earned that name because it is where the famous ticker tape parades are held honoring the accomplishments of wrold leaders, military figures and sports legends. There are plaques in the pavement noting the parades that have been held. Diverting west from Broadway a block, you come to the World Trade Center (Ground Zero) area. 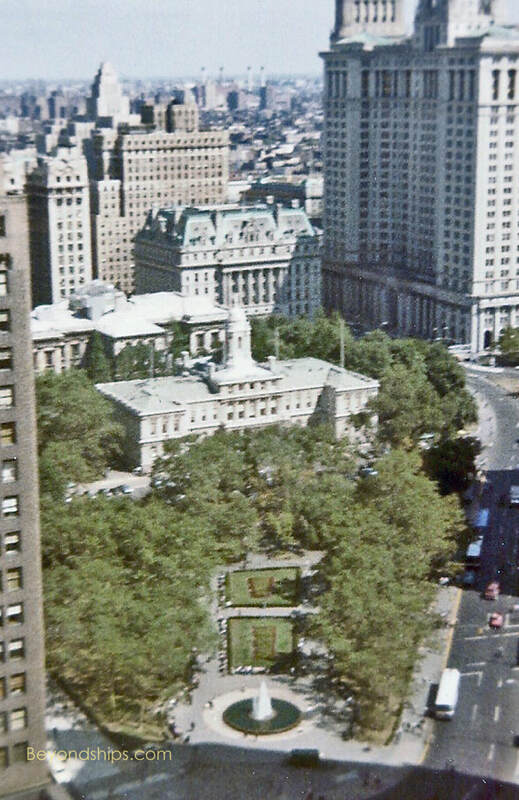 Built on land reclaimed from the harbor, the area included not just the 107-story Twin Towers but also a shopping plaza, a train station, hotels and other office buildings. 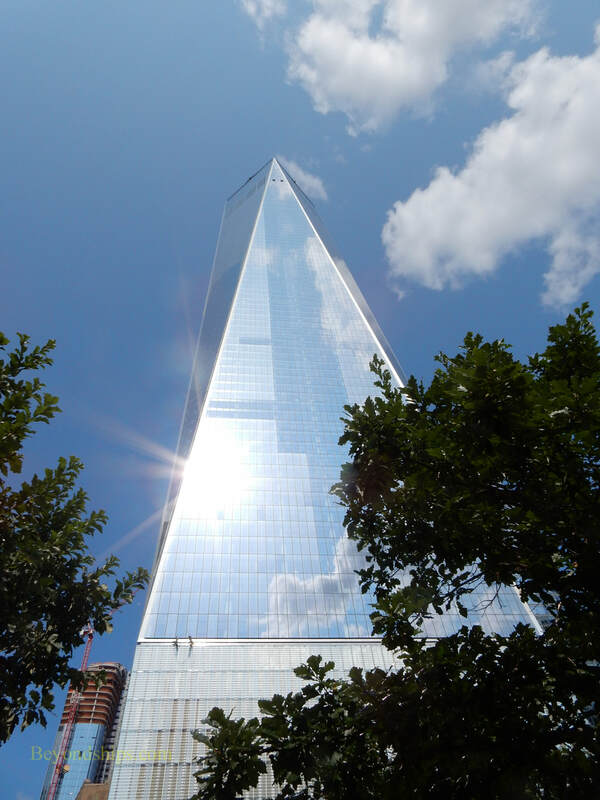 Although devastated in the September 11, 2001 attacks, much of the area has been re-built. The centerpiece of the re building is One World Trade Center, better known as the Freedom Tower. the tallest building in the Western Hemisphere. The area also includes the National September 11 Memorial. It consists of two fountains in a park-like forest. 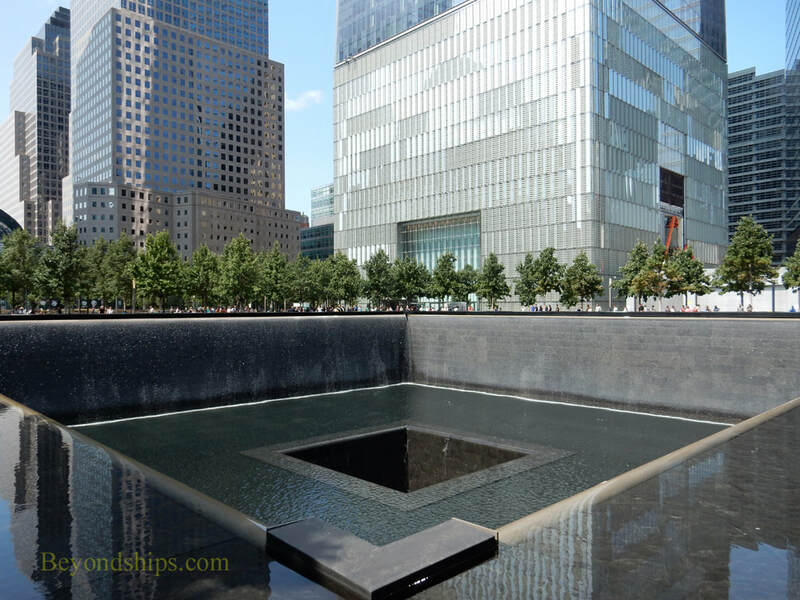 Each fountain occupies the footprint of one of the Twin Towers. The names of the 2,977 victims of the 911 attacks and the 1993 bombing of the World Trade Center are carved into the walls of the fountains. Nearby is a museum that tells the story of the tragedy. in the city. George Washington attended a thanksgiving service here following his inauguration as the first U.S. President. 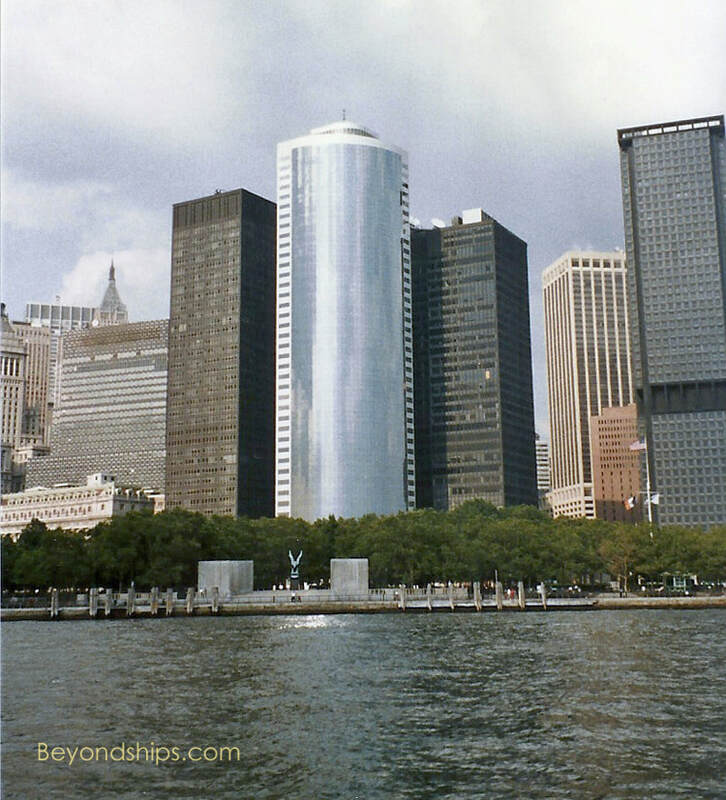 As seen in the photograph, it literally stood in the shadow of the Twin Towers. 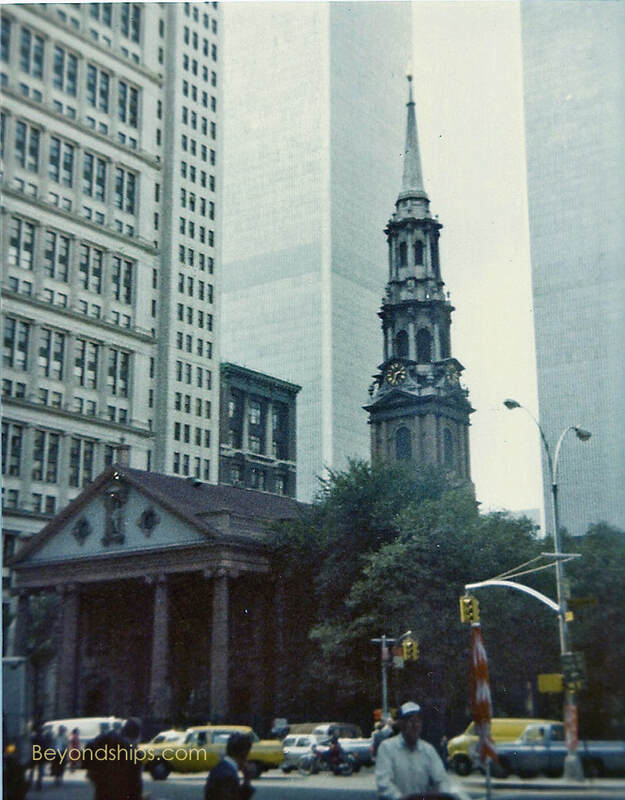 However, St. Paul's was miraculously undamaged in the September 11, 2001 attacks. 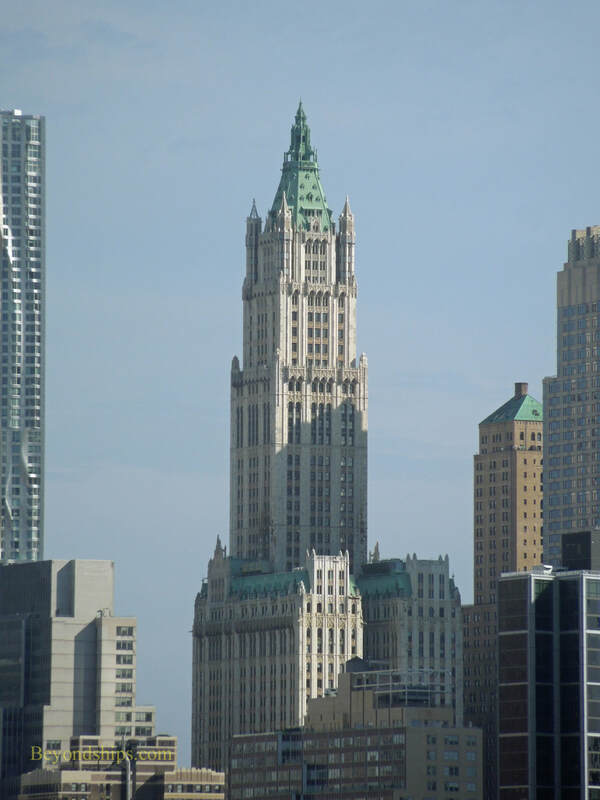 Just across from City Hall is the Woolworth building, known as "the Cathedral of Commerce." Designed by Cass Gilbert, it was the tallest building in the world when it was completed in 1912. In addition to its ornate facade, the building has an elaborate lobby. Public tours of the building are offered.